If you’ve bitten the bullet and invested in an Apple Watch, you’ll want to make sure that you have it for many years to come. What’s the best way to do so? Set some extra money aside for a high quality accessory. HiRise for Apple Watch is an elegant, modern stand that showcases your beautiful timepiece while simultaneously allowing you to charge it overnight. Similar to HiRise for iPhone, it features a stable, metal base that lets you interact with the screen on your watch while its still charging. See alerts, reply to messages, or check the time at a glance. 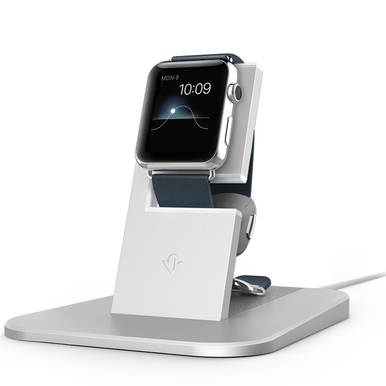 The brushed metal stand is also elevated and angled in such a way that lets you see your watch while you’re lying in bed, while the non-slip rubber base helps to keep HiRise in place. HiRise has been designed so you can quickly and easily insert and remove the charging disk that comes with your Apple Watch. Simply press the magnetic disk on the end of your charging cable into the round, silicone-lined cutout on HiRise to begin charging your watch. When you need to take your cable on a getaway or business trip, pop out the disk and you’re good to go. HiRise understands that worn-out bands can be a real concern for anyone who owns an expensive watch which is why the stand has been finished with silicone accents and a soft, leather landing pad for ultimate protection. HiRise for Apple Watch is priced at €64.99 and is available now from our website.